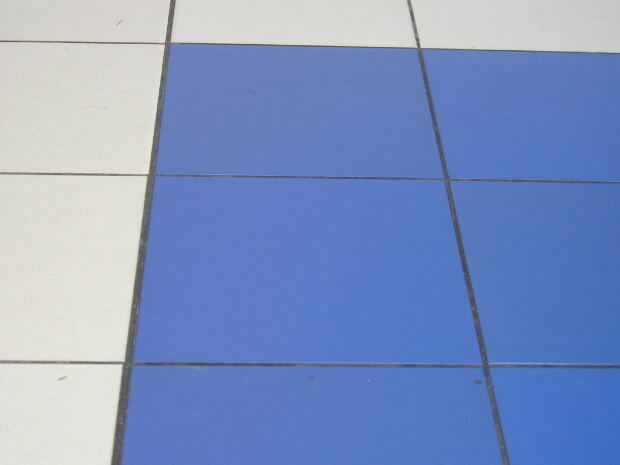 My #1 pet peeve about tile. 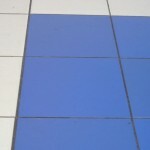 Have you looked into sealing the grout to make the look last longer? Not really. We hadn’t done the grout cleaning in depth since we moved into the house in 2007, so as long as I keep up regularly, I think it will be OK. But I will check it out if it’s something simple! I have a similar situation–my bathrooms are white/white too. In the shower, I used Tilex a couple times in succession and the grout got really clean, but then the shower never seemed to be much of a problem. The floors are what really annoy me. I tried just a steam mop, but that really didn’t do much, and the time requirement would have been too much for me to handle. After tax season, I plan on looking into a solution in more depth, but right now I don’t have much free time to be doing anything about it. We have a steam mop too which works great on the tile itself but it even says in the instructions that it can only clean what it can touch, so you have to get more in depth to clean the grout. 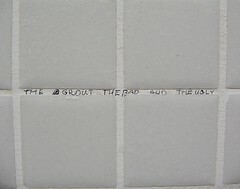 Now that I have read this, I will be noticing how dingy my grout is. Will that motivate me to clean it? Uhhh. Not sure. But if I do, I will have to give the Oxi clean a try. We use it all the time anyway. By the way, we did seal our grout after installing the tile (both in bathroom floor and shower enclosure). I just wonder if it’s too late after the fact. Also given that it’s not perfectly clean I don’t want to seal something that I then might be unhappy with later. Good call. We haven’t introduced the bath crayons yet but I know the previous owners must have used them because I have found marks from them at strange locations in the bathroom. We have a tiled shower, and just cannot keep the grout clean. I swear, if I cleaned that thing every day, it would still get dirty. We are hoping to replace the shower in a year or two, and I hope to just get one of those faux stone solid panels with the only grout being on the sides where the panels are joined. We recently bought a house and remodeled a bathroom. The grout looks so pretty in the bathroom NOW, but I know it’s only a matter of time until it starts looking dingy. I’m going to have to try this! Everything looks great when it’s new but as long as you stay on top of it, hopefully it won’t be as hard to keep up. As some readers have suggested, maybe sealing it is a good thing to consider since it’s new and you wouldn’t be sealing in any dirt at this point. Great advice. You have no idea how long I scrubbed my tile a few weeks ago. I have also looked into resealing it after it’s clean. The sealant they have now is in a spray can, which makes it really easy. Thanks again!